This set comes in an 8 x 12 inch bag. Stimulates Creativity. Set includes racoon, Black Bear, Bobcat, Beaver, and more. Wild Republic allows kids to explore the Wonders of Nature and let their imagination grow! 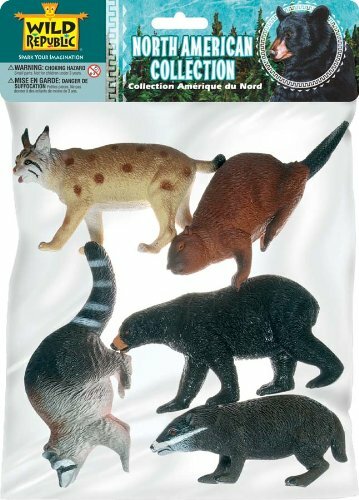 5 Piece Polybag North American Animals Collection by Wild Republic From the Polybag Playset Collection. All of the Polybag Playsets from WildRepublic feature highly detailed animals, lightweight durable plastic and mostimportantly all the pieces are phthalate free. Founded in 1979, K&M; International better known as Wild Republic is a familyowned and operated company that has been delighting and educating children andadults with their large collections of nature related toys and gifts. Allitems created by Wild Republic meet or exceed all U.S. safety standards. Suggested Age 3 and Up. From the Manufacturer Realistic 5 piece set of durable plastic and PVC North American Animals thatlets kids spark their imagination.